Buy valentine's day flowers and chocolates with a delivery to Riga, Latvia. ❶ Buy valentine's day flowers and chocolates with a delivery to Riga, Latvia. A wide assortment of arrangements from valentine's day flowers and chocolates at reasonable prices is waiting for you in the online shop KROKUS. We carry out delivery of bouquets and sweets to any address of Riga and all over Latvia in the shortest terms. To arrange delivery of flowers and chocolates on the website of the studio KROKUS is very simple. Just a couple of clicks and your order is on the way! In addition, you can buy valentines, flowers and chocolates simply by calling us on +371 200 303 06. One of the most romantic and wonderful holidays is considered to be St. Valentine's Day. On the 14th of February lovers give each other their warmth, attention and care, and also congratulate their halves with sweets and postcards. Often on this day, flowers in the form of bright and lush bouquets are presented. The online shop KROKUS is happy to offer a wide range of valentine's day flowers and chocolates with delivery to Riga and other Latvian cities for everyone who wants to give joy and the warmest emotions to their loved ones. ● candles and much more. ● as well as bouquets of peonies, chrysanthemums, orchids, tulips, hydrangeas, gerberas, alstromeries and other garden flowers. 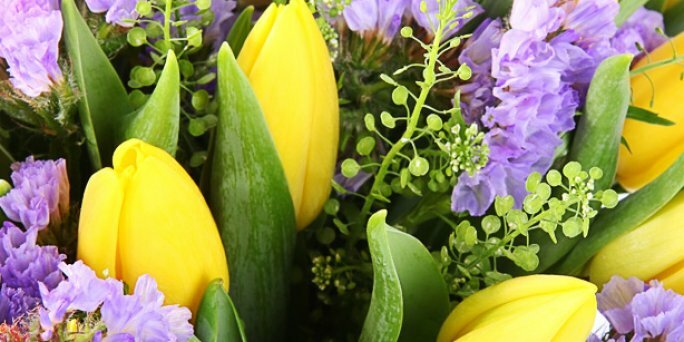 An important advantage of ordering bouquets in KROKUS is the ability to change the size of almost any arrangement presented in the catalog: from compact to large. Thus, you can buy flowers without going beyond the planned budget. If you want to surprise your lover, then simply order the delivery of valentines, flowers and chocolates to the address in Riga or any other city in Latvia from the online shop KROKUS. To do this, when you make a purchase, specify the contact details of the recipient, as well as the desired date and time of presenting the gift. Be sure, the gifted will receive a bouquet on time along with your warmest wishes.